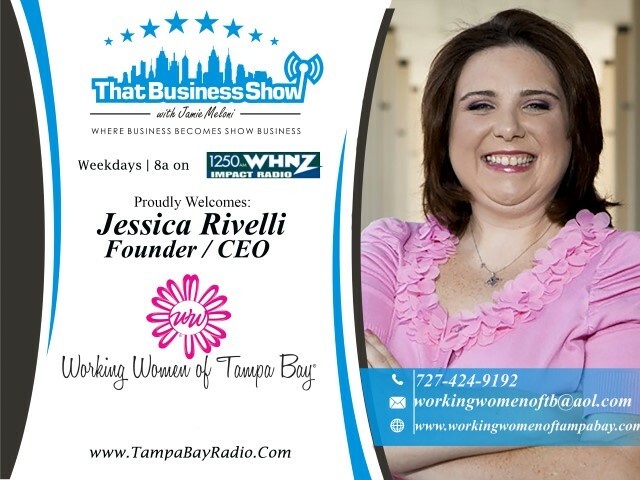 It’s Working Women Wednesdays on That Business Show with Jamie Meloni and CEO/Founder of the networking group Working Women of Tampa Bay joined me on the phone at the top of the hour. Investing in Women was the focus on the discussion and emphasized that consumers and business professionals need to listen to the “power of the purse” and recognizing the powerful economic force that women represent. Women control 27 percent of the world’s wealth. They are the breadwinners or co-breadwinners in two-thirds of American households. In the U.S. alone, women exercise decision-making control over $11.2 trillion – that’s a whopping 39 percent of the nation’s estimated $28.6 trillion of investable assets. They are already responsible for 83 percent of all consumer purchases; they hold 89 percent of U.S. bank accounts and 51 percent of all personal wealth. As Newsweek reported in 2010, “women are the biggest emerging market in the history of the planet.” Visit http://www.workingwomenoftampabay.com for more information on the group and their events and ways that you can get involved! 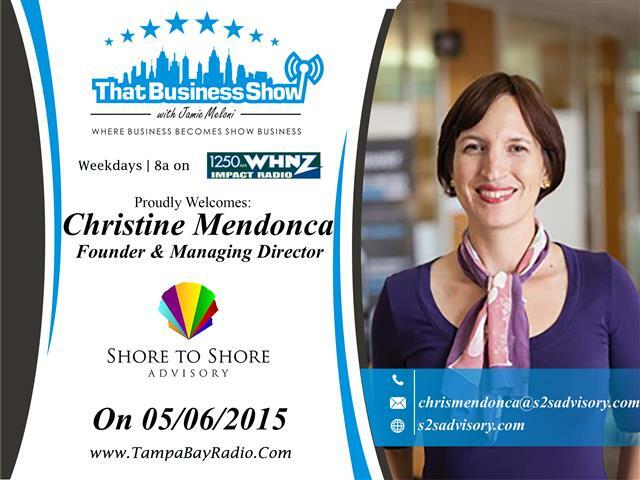 Going into the 2nd segment, Christine Mendonca joined me in studio to continue the discussion. Christine is the founder of her business, Shore To Shore Advisory, an investment advisory company focusing on “Impact” companies. Impact companies meaning companies that are making a positive difference in the community. Christine founded the company in 2010 and shared several success stories with us during the segment in which she helped the investors and companies get funding and exposure through networking. Before starting her company in 2009, Christine became the 5th generation in her family to work in the steel industry and at 21, she managed the due diligence process for Gerdau Ameristeel’s 2004 NYSE Equity and Bond Offering. By the age of 26, Christine led or co-led the integration of $187 MM in acquisitions (6 companies, 27 locations) and supported in the integration of another $4.5 BN of assets. Learn more about her company at http://www.s2sadvisory.com and email her at chrismendonca@s2sadvisory.com for more information! 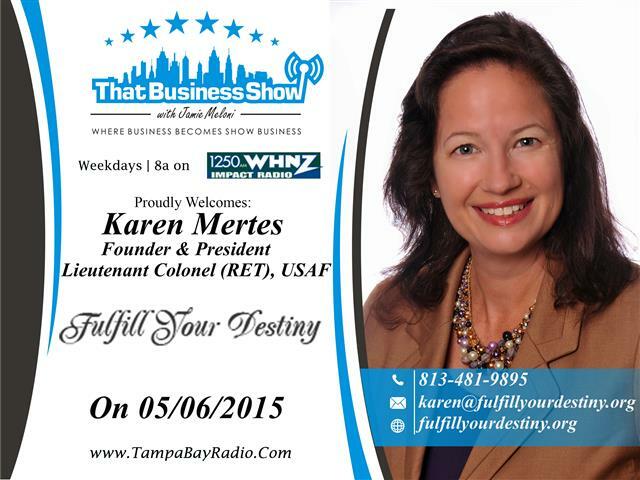 On the 2nd half of the show, I welcomed Karen Mertes, founder of Fullfill Your Destiny. Karen is a Lieutenant Colonel (Ret) from our United States Air Force and turned a life altering tragedy into a life purpose with her organization, Fulfill Your Destiny. This non-profit was inspired by a car accident in 2007 when she was hit by a drunk driver on I-75 traveling over 100 mph and today assists people whose careers have been altered by injury or other unforeseen circumstances. Karen uses an entrepreneurial business model that she’s overlaid onto a non-profit organization, raising money for Fulfill Your Destiny in 11 ways, 5 of which involve her offering a professional service or product for donation. Karen is a Professional Motivational Speaker, Co-author, Certified Entrepreneur Coach, Certified Leadership Coach, Certified Women’s Issues Consultant and creator of Fulfill Your Destiny’s annual signature event, Fulfill Your Destiny’s Spring Chari-Tea held each year in March. Karen is dedicated to enriching the lives of others by bringing business and community together. In her newest keynote presentation, Karen is the designer of The Asset Map System. Stemming from the passing of her mother Renee, who had a Will and Trust but yet her assets were not properly identified. Karen created The Asset Map, a system that allows people the opportunity to accurately identify and consolidate all essential documents and assets in an easy and usable reference resource. The Asset May System – Find your Treasure without the Hunt! Visit http://www.fulfillyourdestiny.org for more information on her organization and feel free to contact her directly at 813-481-9895 or email at Karen@fulfillyourdestiny.org for more information!